Our yacht AURORA is a 60 foot sloop built by Colvic Craft in the UK in 1996. She was designed by David Pedrick for the Clipper Round the World race and has been raced around the world four times. Previous owner was Clipper Ventures Plc based in Gosport, UK. This company was founded by the legendary sailor Sir Robin Knox-Johnston, who was the first person to sail around the world non-stop and single-handed in 1969. AURORA is the perfect yacht for exciting offshore sailing and ocean crossings. On most of our five day trips in the West Fjords we only get a chance to sail a few hours but on our longer expeditions such as to Jan Mayen and Greenland we will spend 2-4 days at the time at sea under sail. Each summer we try to bring a qualified instructor for a few days intensive sail training. If you are interested in joining us or to plan a customized ocean sailing course, please do not hesitate to contact us. The east coast of Greenland is an awesome wilderness. More than 2.600 kilometers of coastline are inhabited by only 3.500 people in two towns and a few small settlements. This is the Arctic with all it's breathtaking beauty and striking scenery. Isafjordur, Iceland is the nearest port to east Greenland, less than 200 nautical miles away. "Amazing adventure with two fantastic explorers. Memories are so important and I will never forget this trip. " "The wilderness is in us all but few can touch or be touched by it. Thank you Siggi and Runar for letting Aurora expand our horizons and perhaps for letting us look into our souls. " "It´s a fantastic boat – super food – lots of fun – very professional "
Departure from Isafjordur at 19:00. Sail out of Isafjardardjup bay towards the Arctic Circle. Sailing across the Denmark Strait. Oportunities to see Dolphins and whales such as Minke, Humpback and Orcas. If weather is clear we may start to see the Greenland mountains in the afternoon. Arrival in Greenland is estimated in the early morning. Where we take landfall will always depend on sea-ice conditions. We may arrive on the Blosseville coast and anchor in Barclay Bugt. We will set sail again and travel south along the coast. Possible anchorage close to Nansen Fjord and the huge Christian IV glacier. The Watkins mountains and the highest peak in the arctic, Gunnbjornsfjeld (3693 meters) line the horizon. Likely a perfect location to take to the water in the kayaks and explore the calm, ice-studded waters of the inner fjord or sail around Soekongen island. Sail a short distance into Mikis Fjord and anchor there. Long-abandoned Inuit ruins allude to a time when the Dorset culture populated the NE coast. The flower-filled Sodalen valley and surrounding mountains offer exciting trips ashore. Move over to Kangerdlugssuaq fjord and perhaps anchor in Suhaili bugt. This is where sir Robin Knox-Johnston and sir Chris Bonington anchored the Suhaili when they attempted to climb the Cathedral peak in 1991. Sail on, following the Kronprins Frederik mountains south whilst keeping a look-out for any anchorages free of ice. Opportunities for hikes ashore or paddling the kayaks. Sail to Sermiligaq fjord and anchor there. For the first time since reaching Greenland, we will pass the tiny Inuit settlement of Sermiligaq many of whose inhabitants still live by subsistence hunting. At the head of the fjord, 5 glaciers reach sea level, calving ‘bergs from many kilometres of exposed ice cliff. The sheltered inner fjord waters offer good paddling conditions and walking inland on one of the glaciers leads to spectacular alpine scenery. 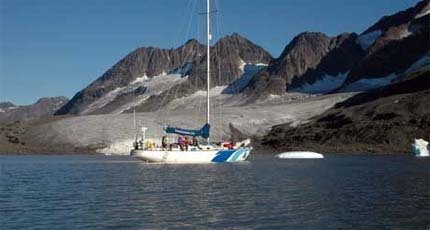 Sail through the narrow passes of Ikateq and Ikasak to reach Angmagssalik fjord. Option to anchor somewhere in this fjord, perhaps by Kungmiut or behind Grise Öen. On one particular meeting of 2 nearby fjords, fin whales gather to feed. Subject to ice conditions, we may be able to anchor within sight of this. Another option is to go through the narrow Ikasagtivaq channel over to the Sermilik fjord and anchor behind the settlement of Tiniteqilaq. Sail out of the inner fjords to arrive in Kulusuk island and tie up at the local wharf. Fly by bi-prop Fokker 50 (not included in price) from Kulusuk over the Denmark Strait to Reykjavik. 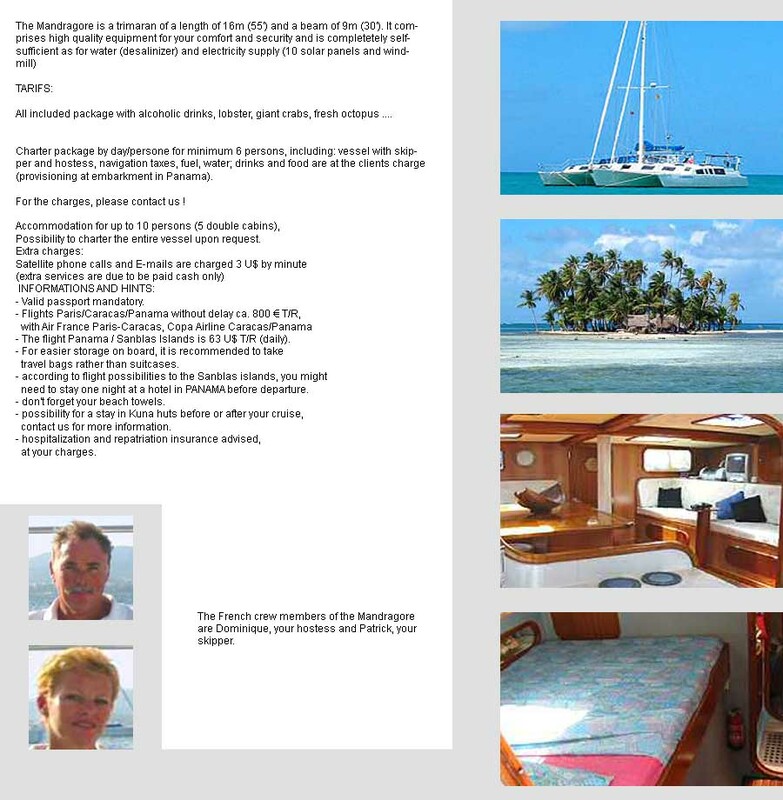 Skipper Sigurður is a Yachtmaster and Naval Architect. He has been sailing, designing and building boats of different shapes and sizes. Was climbing and skiing from very young age in the mountains around Isafjordur and other areas in Iceland. Sailing and kayaking in local waters. Mate on a yacht operating from Ushuaia to Antarctica. Various work and play in the US: canoe guide and winter camping instructor in Ely, Minnesota, work with sailing/diving outfitter in the Florida Keys, AFF skydiving course in DeLand Florida. Alpine Mountaineering course at ISM in Leysin Switzerland. Climbing in the Alps including Monte Rosa, Mont Blanc, Mont Blanc du Tacul and more. Lived in Denmark for four years and Newfoundland for another four years, skied in various locations in British Columbia, Quebec, Vermont and Newfoundland. Sailed on a container ship on route between Germany and Japan. Various fishing trips on trawlers in Iceland, Newfoundland, Labrador and Alaska. Runar Karlsson is a geographer and has worked as a mountain and mountain biking guide in the summer for different adventure companies in Iceland. He has also worked as a tourism consultant for few years but felt it was time to put his skills into practice and put up an adventure operation in cooperation with other good people. Runar was a boy scout when he was younger and learned to love the outdoors and especially the mountains. Skiing, ice and rock climbing and sailing are his favourite sports and now part of his job. He has scaled 6000m peaks in Peru, done skiing expeditons and kayaking in Greenland, climbed in the Alps few times and paragliding in the Pyrenees.. He loves all sports where a helmet is an essential part og the paraphernalia and no engines are allowed except his muscles...! 2009190 Aug. 03 - Aug. 13, 2009 11 10 3300 EUR BOOK! 2009200 Aug. 17 - Aug. 27, 2009 11 10 3300 EUR BOOK! Cutter rigged sloop with anodised alloy spars.